This sculpture may be tentatively identified as an archaic representation of Manjusri, from the closed utpala lotus in the left hand . This flower is exclusively associated with Manjusri, who is moreover not always re p resented with sword or book; the iconography is nevertheless unusual. He makes the boon-bestowing gesture with the right hand, while holding the closed bud of his utpala lotus in the left. Usually the left hand will be closer to the waist, clasping the stem and leaf tendrils from which the closed bud of the utpala lotus emerges. Here the lotus is held against the heart, and it has almost no foliage. The simple high panels of the crown with plain band, the single strand necklace, armband, bracelet, and anklet reflect the influence of Licchavi models, particularly certain sculptures now conserved in Tibet, which also have a similar lotus pedestal . 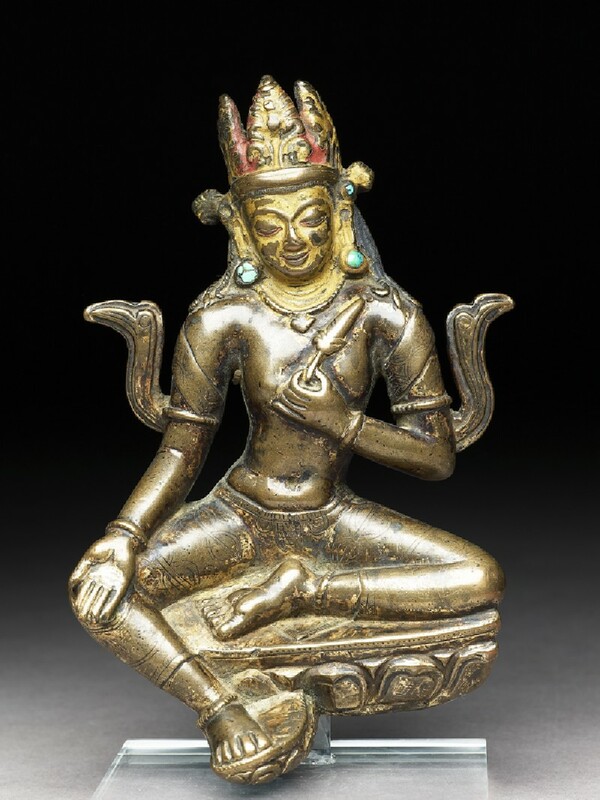 The square face, the gently downward glance, and the overall diminutive proportions also reflect Nepalese aesthetic influences, as does the high percentage of copper in the alloy. 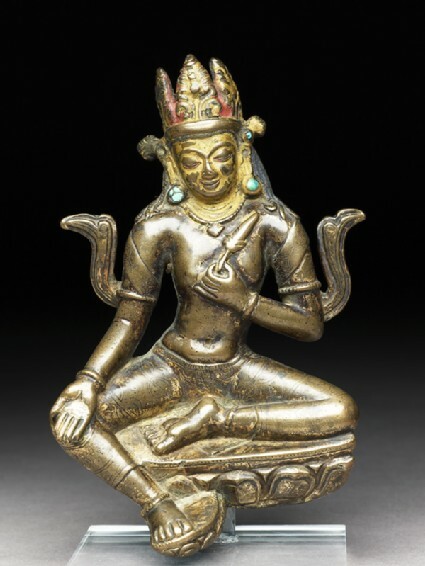 Rather than being a lost-wax casting typical of Nepal, however, this statue appears to be solid cast, with a tang and two holes in the reverse beneath the lotus pedestal. The pedestal appears to be broken under the leg resting on its individual lotus, but in fact is sculpted in this way. It is a very distinctive system for supporting the leg. Possibly the statue would have been affixed to a nimbus surrounding a very large image of a Buddha, or else possibly attached within a niche in an altar. Intended to be viewed only from the front, the image is replete with inlay work, cold gold paint on the face, turquoise fragments in the earrings, pigment in the hair, and gilding on the body. The back is completely unfinished: while the outline silhouette and the garments are defined, there is no belt, and the metal has a rough and uneven surface. Indications of Tibetan ritual consecration practices are the matt gold on the face and the use of pigment and turquoise, which may be a substitute for inset semi-precious gems which originally formed the finial of the earring. The consecration practices certainly indicate that statue was worshipped in Tibet at some time. The dhoti and sash have very detailed patterns based on circles, confronting or interlocking or divided by bands at the middle. The scarf is quite stylized, draped in rigid folds which are suspended in thin air. Although the scale is somewhat larger, this graceful Manjusri recalls the attitudes and jewellery of some of the figures sculpted in the wooden lintels of the Lhasa Jokhang, which are generally attributed to Nepalese artists working in Tibet, probably in the early eighth century . The crown, single strand jewellery, and the unusual arm gestures also recall early ninth-century sculptures of the group of the Eight Bodhisattvas surrounding Vairocana sculpted in the rock-face in eastern Tibet . We may therefore suggest that this image is the work of a Tibetan artist strongly inspired by Nepalese aesthetic influences, during the ninth century. 1 de Mallmann, Introduction a l'etude du bouddhisme tantrique, p. 252: two aspects of Manjusri with the varada mudra, either red in body colour, or white. 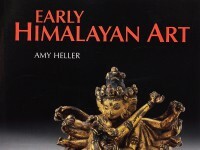 2 von Schroeder, Buddhist Sculptures in Tibet, vol. 1, pl. 148A-C.
3 Although Tibetan traditional accounts date the construction of this first sanctuary in Lhasa to the seventh century, the carved lintels make reference to the iconography of Buddhist sutras which were not translated into Tibetan until the 8th-9th century; as the carvings must postdate the introduction of these texts to Tibet, an 8th-century dating for them is to be preferred. 4 Ibid., vol. 2, pl. XII: 9, for the rock carvings of Vairocana and the Eight Bodhisattvas of 816ad, according to the Tibetan dedicatory inscription of this sculpture; its history was first studied by this author in 1994 (Heller, 'Early ninth-century images of Vairocana from Eastern Tibet').